You will love this recipe for these cookies if you do. I remember first eating peanut butter cookies in elementary school. My memory of them is that they tasted heavenly and melted in my mouth. In this recipe I added another step once they are baked. They look pretty and taste divine. Enjoy! This recipe was taken from our newspaper many years ago and is one of my favorites. When the cookies are baked and cooled, I dip half of the cookie in melted chocolate using melted chocolate chips. My First Batch of Cookies. Well, I’m a little late, but managed to bake my first batch of cookies yesterday. I used a recipe that I cut out of a C and H box of sugar many years ago and you can tell by the stains on the card that it was used many times. These little delights are very easy and you don’t need very many ingredients, although I did add one additional ingredient to make it my own. I added a 1/2 tsp. of Abuelita granulated Mexican chocolate mix to the flour mixture and 1/2 tsp. of the chocolate mix to the sugar and cinnamon mixture just to give it a little punch of extra flavor. Although the recipe calls for 10 minutes of bake time, you might want to try 9 min. The 10 minutes gave my cookies a toasted bottom. I have been feeling very nostalgic for my mom’s cooking and baking lately. It might be because of my age that I long for those “good ole days”. She would bake delicious cookies never having to use a recipe. 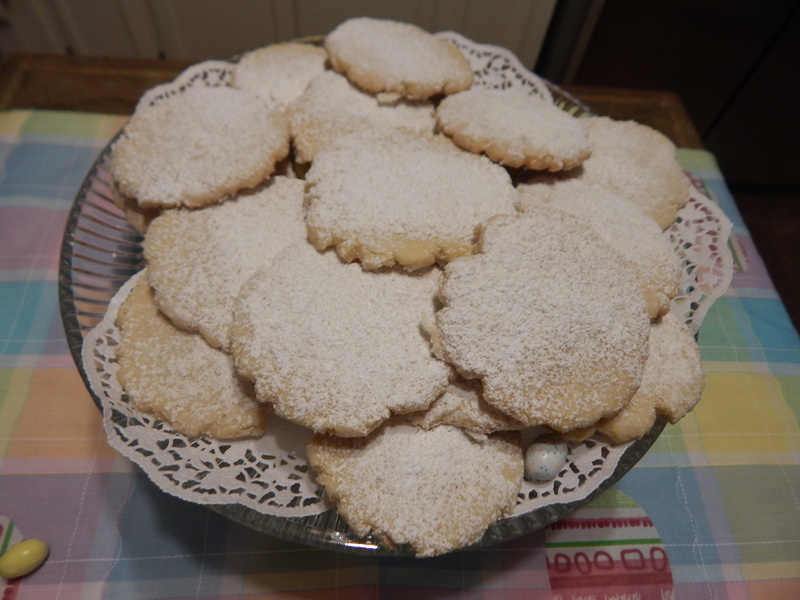 One cookie that I loved was her Anise cookies which I have not eaten since I was a child. I searched for a recipe that I thought my mom would use, something simple, but tasty. Most of the recipes I found asked for rum or brandy…….no that would not do. We never had fancy liquor in our house, nor would my parents be able to afford to purchase liquor just to use in a recipe. Luckily, I found a simple recipe on http://www.cooks.com. And to make it my own I added about 1/2 tsp. of orange zest. With mixer beat butter, sugar and vanilla until smooth. Beat in flour, anise seed, and orange zest. Refrigerate 60 minutes. Roll flat and cut with cookie cutter. Bake on ungreased cookie sheet 8-10 minutes at 400 degrees. Cool and then roll in cinnamon and powdered sugar after baking. ♥Love this recipe. The cookies were more of a shortbread type cookie and very good. I truly don’t remember what my mom’s cookies tasted like, I just know that I loved them. By the way my hubby , my oldest grandson, and my oldest daughter gave me a 5 star rating on the cookies. My son-in-law, Aaron gave me a 4.7 rating…. hmmm.